The Soccer 20 Ten is any Soccer fans dream castle. It is a fun idea to have a Soccer Party. There are various games one can play, but for all the kids to get a chance, let them all take turns to be goalie while the other kids take turns to kick the ball into the goal. 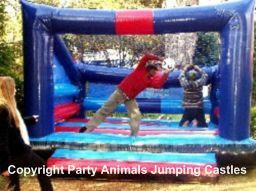 Can be great fun for a School fun day or even for a Corporate or Team Building Event. Two Soccer 20 Ten castles can be put up to create a real Soccer field effect. The motor is a .75kw motor with a 15m extension lead. If your closest power point is further than 15m from where the castle will be placed you will need to supply an additional extension lead. These are not supplied by Party Animals.